Download: Ringle All The Way! Buy ‘Mass Trespass’ on CD! our store or on iTunes, Amazon etc. It’s been a busy few weeks at Ringlefinch HQ lately, as we finish recording on the album and get to work on mixing – it’s all sounding great, and we can’t wait to share the songs with you! 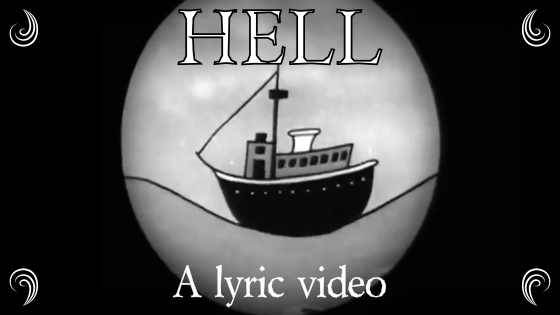 But we’ve also been beavering away behind-the-scenes on a new secret project as well, and today we’re tremendously excited to share with you our brand new lyric video for our song “Hell“! Taken from our EP ‘Mass Trespass‘ (available on iTunes, Amazon, Spotify, etc, and on CD via our website), “Hell” is an autobiographical jaunt through one man’s life – a song about discovering independence and identity, self-expression, and songwriting. And going to Hell, of course. Since “Hell” has rather taken off on SoundCloud (with over 94,000 plays at the time of writing! ), we’ve been bombarded with people asking for the lyrics. We naturally thought, “What better way to share them than through the medium of a re-edited public domain 1930s cartoon about a man, his dancing dog, and his vaguely terrifying tuba?”. Huge thanks to everyone for your support, and we hope you enjoy the video! Is the week treating you well? It’s certainly treating us well, as we’ve just passed a mighty 100,000 plays on SoundCloud for the songs on our EP ‘Mass Trespass’! This is a real watershed moment for us, and is tremendously exciting given how well work on the album is going at the moment. Huge thanks to everyone for your support! In the meantime, we’re booking up shows at festivals this summer and pulling together our plans for getting out on tour later in the year. Stay tuned for more details once things start getting confirmed over the next few weeks! 2018! It’s an exciting time for music. The industry has changed beyond all recognition over the last 20 years, as the Internet has changed how we find and listen to music and big record labels have scrambled to react. In many ways, it’s harder for bands to make a great album these days as labels are much more cautious – there is far less money around for artist development and for taking risks with bands who are unsigned or who don’t fit a particular musical niche. That means more bands have to go it alone when it comes to recording… though we’d argue that is not inherently a bad thing! Although label support and funding has dried up considerably in the Internet age, we have better access to more information than at any time in human history. Even better, recording technology has advanced to the point now that it’s entirely possible to get good results with relatively modestly-priced gear and with skills learned from experienced professionals sharing their know-how online. So while it’s that much harder to get a recording session in Abbey Road Studio Two, it’s that much easier to get a decent-sounding recording of a great song in a humbler setting – without having to compromise on the band’s vision. Witness the explosion of diverse, vital, tremendously exciting songs taking over 6 Music in the last few years. Ringlefinch is a band built on DIY. Most of us are self-taught on our instruments, and we’ve shot all our videos ourselves (as well as doing everything for many of our recordings, particularly the soundtrack we did for comedy film Making It). For our debut album, we’ve been taking this to extremes – not only recording and mixing the album ourselves, building on the lessons we learned from working with the marvellous Ben Walker on the Mass Trespass EP, but doing so in a studio that we built (gear and all!). It’s maybe not the quickest way to make an album, but we’ve learned a huge amount, it’s a lot of fun, and most importantly it’s sounding great so far! Of course, this doesn’t mean that it’s a golden age for the musicians or recording / mixing engineers themselves – although information, skills and tools are easier to access, the money itself hasn’t been democratised in the same way as the bigger labels try to protect their bottom line by mostly putting out songs that sound like the last big thing, rather than trying to find the next big thing. It’s that much harder, then, for artists and engineers to make ends meet while also making interesting, challenging music. Perhaps this is where blockchain technology (such as Imogen Heap’s Mycelia initiative) can help make the difference, by ensuring the rights – and the money – are more closely tied back to the people who made the music in the first place? We’re going to be debuting some of our new material over the next couple of months, and we’ve got some great gigs coming up that we’d love to see you at – including our first ever show in Brighton! Finally, we were going through the archives recently and stumbled across a gem of a live video from the Magic Garden in Battersea of us performing Nick Edward Harris’ atmospheric classic ‘Angra Mainyu’ with our good friend Emily Mae Winters. Enjoy! Hello! We have a couple of special gigs coming up that we’re bursting to tell you about and aching to see you at! We’re playing one of our more epic gigs on Sunday 30th July when we’ll be performing two 45 minute sets at the Lamb in Surbiton. So if you have a favourite Ringlefinch song, the chances are we’ll be playing it! Then on Saturday 5th August, the folks behind the legendary Folkroom and Before The Goldrush nights are joining forces to stage a variety show, featuring a pub quiz, live comedy and music, at The Harrison near King’s Cross. We’ll be providing the music and maybe some humour too (some of it possibly even intentional!). All Rights Reserved. © RINGLEFINCH. Support Local Music.